After attending the Pulled Pork Competition at the BC Home & Garden Show where we were tortured by the sights and smell (without being able to actually try it! ), Viv and I were starving. So without further ado, we hightailed it outta there in search of eats. Whenever we are short on time and still want something tasty (that does not have a drive-thru), we always turn to the standby - Pho. And where would we find such a thing? Duh. Kingsway of course. 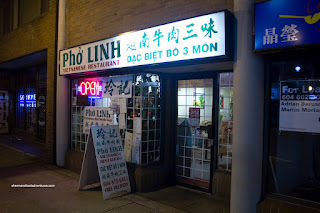 However, while we took the turnoff from Main onto Kingsway, I remembered Pho Linh near Hime Sushi, so I took an immediate left onto Broadway. 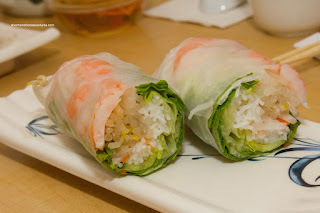 We got one each of the Salad Roll and Spring Roll to start. As much as these items can be rather cliched in terms of Vietnamese food, we were pretty happy with them. The salad roll was rolled tight where the filling did not fall out, yet not squished at the same time. We liked how the shrimp was seasoned and that added an extra punch of flavour. One thing we would've like to see was Thai basil mixed in with the greens. 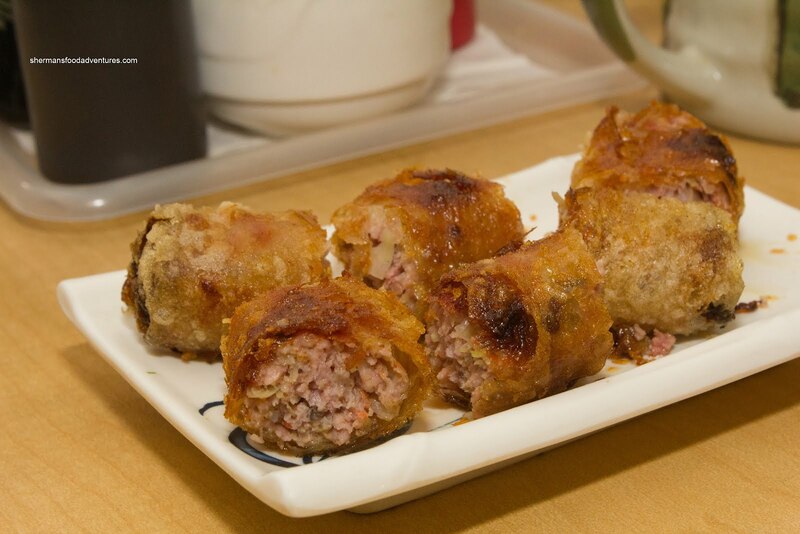 We thought the spring roll was even better. Before we even ate any, the use of rice wrappers made it legit. They were fried up golden brown and were crisp. The best part was the filling. It was moist, not-gritty and full of flavour. There was good hits of fish sauce and onions. It tasted good on its own, even without the nuoc mam cham. 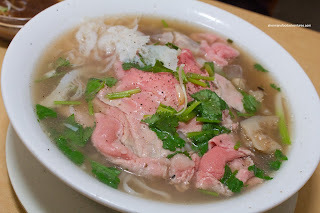 Viv went for the Pho Dac Biet and for a small bowl, there was no absence of noodles and meat. This could pass for a large bowl in some places (Vietnamese Restaurant and Phố Hoàng Tung come to mind). The soup was on the lighter side, however, it wasn't without flavour (seemed light on the MSG too). It was pretty balanced. The meats were plentiful and tender as well. Since Viv had the Pho, I resorted to ordering something different in the Bun Bo Hue. When it first arrived, I was a bit skeptical since the "spiciness" seemed merely plopped on one side of the bowl. However, one taste of the broth and there was a definite lemongrass hit and a decent amount of heat. I really wasn't expecting that. 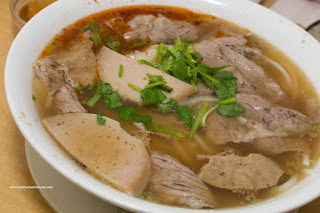 You know how some places where it is hard to differentiate between a regular beef broth and the bun bo hue broth? Not here, it was obvious. Now, I'm not saying this is the best I've ever had, but it was pretty good for what it was. Again, there was plenty of meat and a good amount of noodles (wished there was a pork knuckle though). The one complaint we had about these bowls of noodles was the temperature of the broth. It could've been hotter. 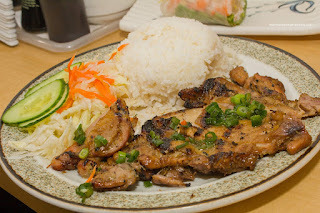 For no other reason other than we just had to try a rice dish, we also ordered the Lemongrass Chicken on Rice. Once again, the portion size was pretty good and the chicken certainly had lemongrass flavour. The meat was a bit flat which in turn made it slightly dry in spots, but it wasn't too bad. There was some char on some parts, yet we could've stood for more. The rice was prepared properly being neither too wet not dry. As you can ascertain, the meal as a whole was pretty good. 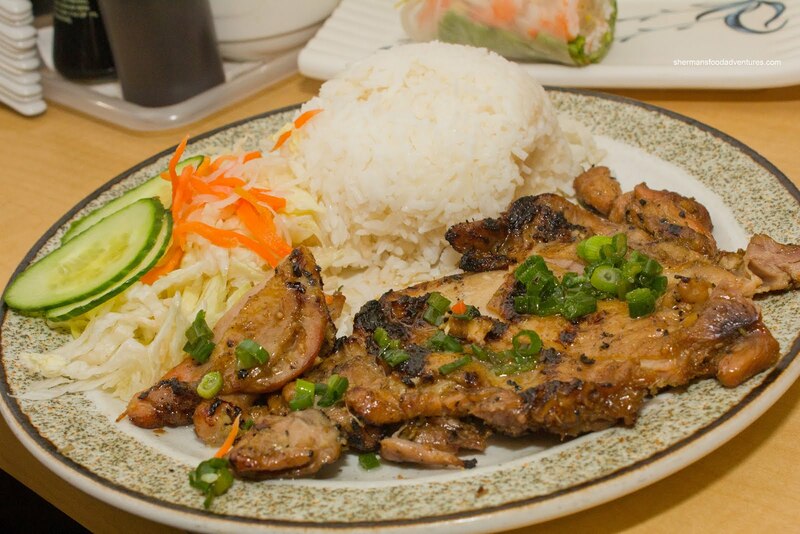 It wasn't the best Vietnamese we've ever had in town, but it is certainly above-average. Coupled with the personable service and reasonable prices, Pho Linh is a place we would probably make a return visit.